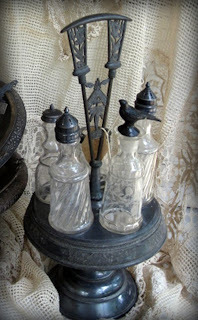 I absolutely love old condiment caddies....I like repurposing them and adding fresh flowers to the jars making a spectacularly dramatic centerpiece. 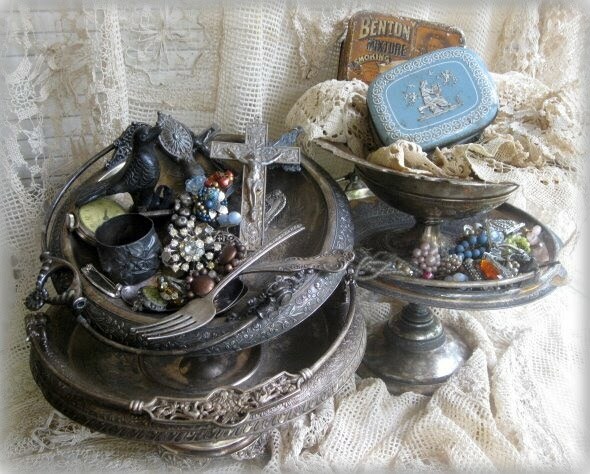 of it....jewelry, lace tins and these beautiful silver plated basket...oh boy...I've got keep-it-itis AGAIN! So what do you do with all this stuff? 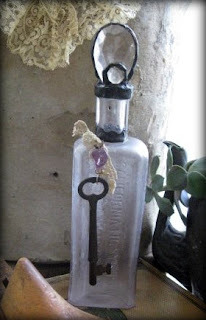 Well, lately besides revamped jewelry I've been into altering antique bottles. Did you ever stumble across something that just fits? I think this is one of those things for me....I could sit and add elements, wrap wire, tie lace and play with solder ALL DAY! 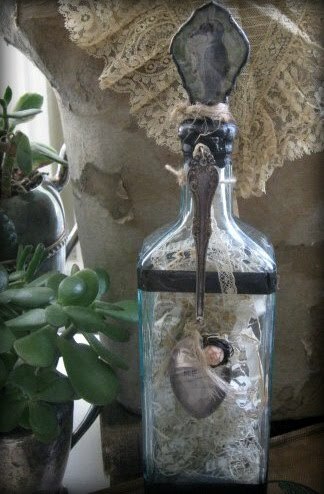 These bottle are just one of those projects that is so much fun to do and because not one is exactly the same....I don't get bored and flit off to another corner of my studio and start something else in the middle. I really enjoy making them! I have a few listed for sale on etsy...more to come! Thanks for stopping by and letting me share my goodies.....be sure to stop over and check out Lemoncholy's Flight of Fancy for Flea Market Friday and the gals at the French Cupboard for the Altered Art Party..have a great weekend! Lovely bottles! I especially adore the bottle with the little nest on it. Very unique! Your altered bottles really turned out great. I can see why you enjoy making them. This is a wonderful way to take an old, discarded bottle and turn it into a piece of art. Thanks for coming by and leaving a comment! 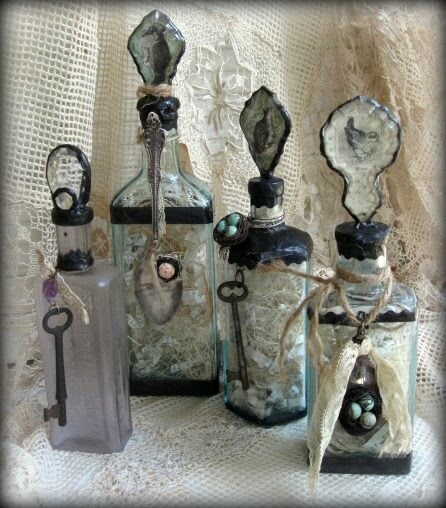 I adore those bottles!!! And I can so relate to the bordom thing! The bottles are amazing! You start with one and the imagination just flies doesn't it? Hi Beth ~ I love them ~ so so so pretty. Are you selling any? I know - stupid question, but I seriously love them. All the elements are there ~ why can't I figure out how to solder better?? Great job ~ Have a fantastic weekend. ...oh...my...goodness!!! 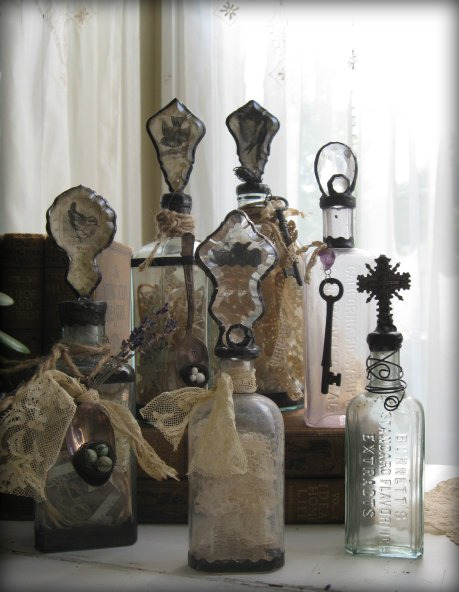 I'm just swooning over those bottles! Simply fabulous!! That is a really nice castor set...love the little bottles, too. Looks like you had a jolly good time at the flea! the bottles are stunning! thanks for the early morning tea - and there was another top hat there - you must have missed it! they were interesting though as they were "collapsible". they had this weird wiring on the inside to help it collapse and it made the hat very tight and hard to wear - so i had jeff remove the wiring and now it fits better! I don't believe I've ever even seen one condiment tray so lovely as that! And your bottles... oh my! I love them!! My dad, my brother and my son are all welders and I don't have one inkling how to solder - lol! Thank you for sharing your beautiful altered pieces with us!! Beth, love the bottles, especially the stoppers and the key look...very creative! You sure a talented and inspiring blog friend. Hi Beth! It was great meeting you today, too! You inspired me to go to our local fleamarket more often... I live about fifteen minutes away and have only gone twice this summer!